Mundulla Primary School’s new microscope, plant press and books. Photo: Jenny Dungey. At the end of September 2014, State Herbarium Weeds Botanist Chris Brodie cut the ribbon at the official launch of the Mundulla Primary School Herbarium Project. 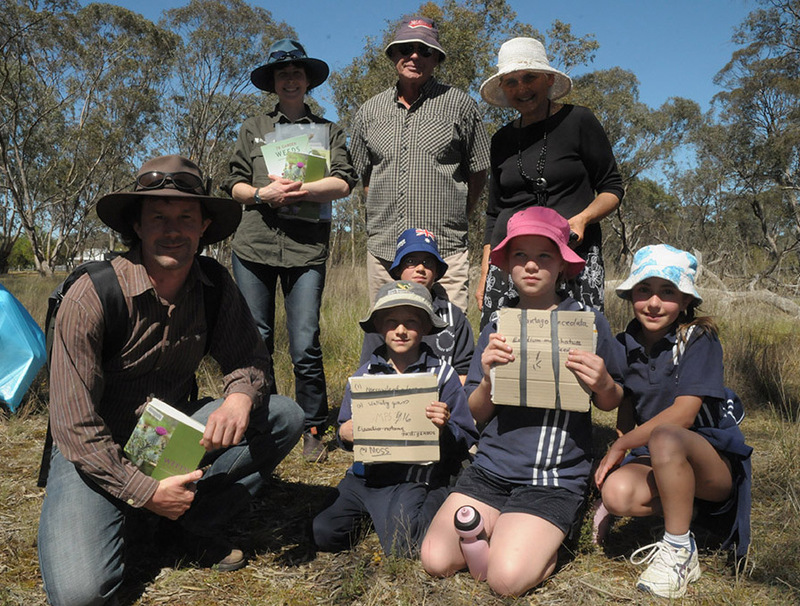 He also conducted a “weeds walk” with school children in nearby bushland. The launch was a great success and highlighted the partnership between the school and the community, the NRM Board, DEWNR and the State Herbarium of South Australia. The school received an NRM grant, which was used to purchase a high performing microscope, capable of connecting with an interactive white-board, as well as a number of reference books. 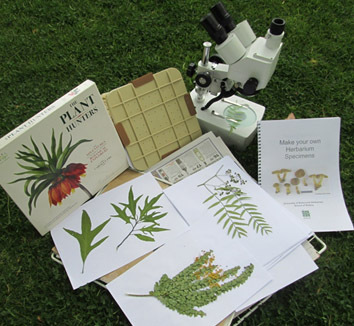 … as a major component of my year 3/4/5 Science class work this term (Biology: Plant Science), students have been instructed and engaged in the learning associated with collecting, identifying and writing information reports about plants they have found. … The main purpose of a Herbarium is to allow for identification of plants, so that appropriate actions may be implemented if weeds require eradication or rare species need a helping hand to survive. Much of this work has been very professionally conducted by one of our local volunteers Dee Provis. Her knowledge and enthusiasm has rubbed off on many students and we have at least ten youngsters who want to be Biologists later in life. Weeds Botanist Chris Brodie, NRM Officer Becky McCann, Principal Jo Artz and volunteer Dee Provis (from left to right) with Mundulla Primary School students. Photo by Benn Gransden, Border Chronicle. The Mundulla herbarium and the books will be stored in the local library, to assist with increasing the knowledge held within the local community of both indigenous and exotic plants. Both the school and the community will add to the herbarium over time. It is hoped that the project will serve as a model that can be transferred to other local government areas in the South-East. The launch has been reported in the local Border Chronicle. The paper also gave permission to reproduce the photographs in this blog article. This entry was posted in News on 16 October, 2014 by Jürgen.